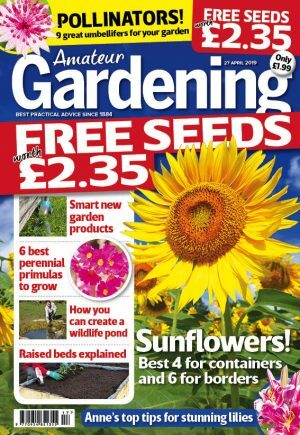 Thompson & Morgan, which had its seeds featured on hit BBC series The Apprentice (3 December 2014), is offering Amateur Gardening readers a chance to snap up the variety featured on TV for a bargain price. Keen-eyed AG readers may have spotted T&M’s Nigella ‘Persian Jewels Mixed’ on the hit BBC1 prime-time show, which is hosted by Lord Sugar. As part of a contest, two teams of entrepreneurs had to buy 10 items at the best possible prices. One of the items on their shopping list was nigella seeds. Visiting London garden centres, one team used its bargaining skills negotiate the rock-bottom price of £6.72 for three packets – a saving of £1.35 on the retail value. The variety is usually priced at £2.69 for 600 seeds. T&M eCommerce manager Clare Dixey said: “It’s great to get such good exposure on one of the BBC’s most watched programmes, but why should the apprentices be the only ones to get a bargain from us? A search on the T&M site for ‘Nigella’ will also bring up a link to ‘Delft Blue’ – a new bloom for 2015 featuring blue and white flowers. Go to www.thompson-morgan.com to order. Please note: the discount will only be added once the items have been placed in the basket.